Preheat the oven to 90 ºC. Line 2 baking sheets with greaseproof paper. Now tip the egg whites into a large clean bowl (not plastic) and add the vanilla, if using. Start to beat the egg whites on medium speed until the mixture forms firm little peaks. Increase the beater speed and start adding a dessertspoonful of caster sugar at a time. Beat a few seconds between each addition. It’s crucial to add the sugar in small increments, as it will prevent the meringues from weeping later. However, be careful not to overbeat the mixture. When the mixture becomes thick, glossy and ribbony stop beating: sift a third of the icing sugar over the mixture, then gently fold it in with a large metal spoon or rubber spatula. Continue to sift and fold in the icing sugar a third at a time. Don't over-mix. Drop spoons full of the mixture onto the baking sheets, leaving room in between each meringue. 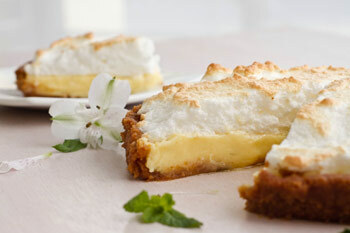 Bake for 90 to 100 minutes in a conventional oven (75 minutes in a fan-forced convection oven) until the meringues sound crisp when lightly tapped and are pale golden in colour. 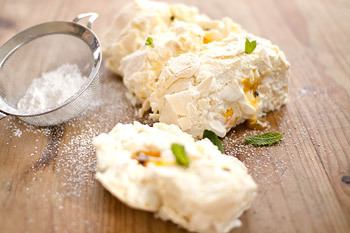 A large meringue (Pavlova) would require longer baking time: between 100 and 120 minutes. And two or more large flat disks (Gateaux) would require less baking time: 80 - 90 minutes. Once you're happy with the meringue colour and crispness, you can either turn the oven off or open the oven door slightly, leaving it to cool in the trays, or place the meringues on a drying rack to cool. 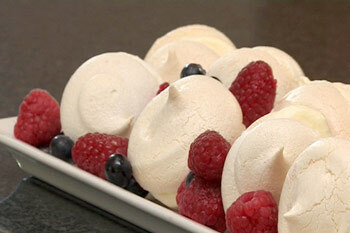 Once they're completely cool, you can embellish and garnish and serve your meringue(s) any way you like. Makes about 36 smallish meringues, one large or 2 - 3 large flat disks. For the caramel, heat 125 ml of the sugar and water over medium heat, stirring until the sugar dissolves and starts to cook. Increase the heat and cook for a few minutes until it turns to a light golden colour. Remove from the heat and immediately pour into six ramekin dishes, swirling the dishes around to coat the base and sides and set aside. Place the reserved 45 ml sugar, milk and vanilla in a saucepan and heat just to boiling point. Stir to dissolve the sugar and remove from heat. In a mixing bowl, beat the eggs and extra egg yolks until they thicken and become pale yellow. Gradually add the milk mixture to the beaten eggs, stirring well. Strain the mixture through a sieve into a jug and pour it into the ramekins. Place the ramekins in a deep baking tin and add enough boiling water to reach halfway up the sides of the ramekins. Place the baking tin in the lower part of the oven and bake at 170°C for 40 minutes, or until the centres of the custards are firm. 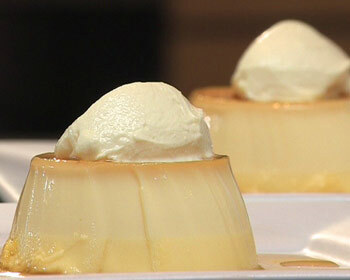 Do not allow the water to simmer during baking because if it does, the custard will have a grainy texture. Remove the ramekins from the water and allow to cool.Once cool, place them in the fridge for a couple of hours to chill. To serve, run a knife around the edge of the ramekins and invert onto small plates, adding some crème fraîche. Mix together the cornflour and white sugar in a large mixing bowl. Add the egg yolks, condensed milk, cream, lemon juice and zest and whisk well. Pour the mixture into the prepared crust and bake in the oven, preheated to 170ºC, for 20 minutes or until the mixture is firm but still a little wobbly in the centre. Remove from oven and set aside. Increase the oven temperature to 180ºC. When the pie has cooled a little; whisk the egg whites into soft peaks. In a small bowl, stir together the caster sugar and cornflour and add the mixture, one heaped teaspoon at a time, to the egg whites while continuing to beat well in between each addition. When the mixture is stiff and glossy, spoon or pipe on top of the pie and return to the oven for 10 minutes or until the meringue looks beautiful to you. Line a Swiss roll baking sheet with baking paper, spray the paper with non-stick spray and set aside. In a small bowl, mix together the caster sugar, cornflour and lemon zest. In a large glass or copper bowl, beat the Nulaid egg whites into soft peaks and holding its shape. Add a heaped dessertspoon of the caster sugar mixture at a time and beat well after each addition. When all the caster sugar mixture has been incorporated and the meringue has become thick, glossy and reached ribbon stage, spoon it onto the baking sheet and spread it out evenly with a spatula. Bake in the oven, preheated to 180ºC for 20 minutes. Leave the meringue in the oven, switch the oven off and leave the door slightly open until the meringue has completely cooled. To complete the roulade, place a fresh sheet of baking paper on top of the meringue still in the pan. Lightly place another baking sheet on top and smartly flip the whole lot so that the used baking paper is on top. Carefully peel the used paper off and your roulade is ready to be filled with the cream and fruit. When done, roll it up carefully (a clean kitchen towel underneath helps), garnish with extra fruit and mint and dust with icing sugar. Preheat the oven to 120ºC. Line a baking sheet with baking paper and grease with non-stick spray. Dust with cornflour. For the macaroons, sift together the icing sugar and ground almonds 3 times. In a separate bowl whisk the egg whites until soft peaks form. Spoon in the castor sugar, whisking until the mixture becomes thick, white and glossy. Add the food colouring and blend. Fold in the almond mixture a spoonful at a time. Put the mixture into a piping bag with a round nozzle and pipe 2 – to 3 cm circles on the baking sheet (don’t twirl the nozzle). Rapidly lift the nozzle so it doesn’t make a point. Leave the macaroons for 20 minutes or until they’ve formed a skin on the surface. Bake for 20 minutes or until the macaroons can be lifted with a palette knife. Leave to cool on the sheet. To make the ganache, melt the chocolate in the microwave. Stir every 15 seconds. Stir in the yoghurt and let the mixture cool until thick – in the fridge if you are in a hurry. Sandwich the macaroons with the ganache. Leave until firm before serving.